Martin Reece is rich, successful, married to Ellen with a daughter Kylie. Having sold off his IT Company for a lot of money means he doesn’t have to worry about working. But work he does – at finding the bodies of women murdered by serial killers. It’s not a job he can talk about to anyone, save for when he calls in ‘his finds’ to tell the police where they are – and maybe to taunt them just a little for their past failures. But that’s done anonymously using a voice-changer. 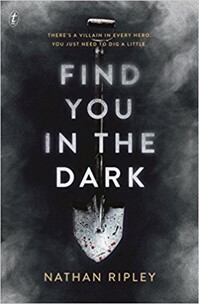 Using police files bought from a corrupt cop to interpret a variety of clues left by the killers, Reece goes on solo camping trips to uncover the remains before making his jubilant calls. He sees himself as performing a service for the families, a function in place of the police, whereas in reality he’s like a rich man with too much time on his hands, and an unusual hobby. But this hobby has unexpected dangers. One is Detective Sandra Whittal, who has dubbed him ‘The Finder’. Determined to bring him down, she’s convinced that he must know more than he’s letting on. In fact, she begins to believe that he may be a killer in the making, and that his obsession may one day bring him to provide a body of his own. The second danger is much more lethal. The Ragman is a shadowy figure who realises what Reece is doing, and resents his interference. Because The Ragman actually knows more about the bodies than Reece, and wants to keep the knowledge to himself. And he’s soon on Reece’s trail… and that of his wife and daughter. This is a story about obsessions: the obsession of a man intent on beating the killers at their concealment game and proving to himself, that he can do something worthwhile; contrasted against the obsession of a cop trying to bring him in, when her colleagues and experience tell her she is barking up the wrong tree; and the obsession of a murderous figure who has been in the shadows for a long time, and cannot abide the idea of someone stealing his thunder. Told in the first person by Martin Reece, interspersed with third-person voices of Detective Whittal and The Ragman, I can’t think of this as an unreliable narrator, more of an unlikeable one. Reece has a police record for unsavoury behaviour as a juvenile, although many years in the past. But he ignores his family in order to pursue his obsession, even when he knows he’s been careless at one point and is getting steadily closer to being exposed. In fact, there are hints that he might welcome that. By remaining anonymous, he’s not being any kind of hero, rather is contriving to twist the knife for the police and families, all the time seeing his motives as laudable. The writing here is absolutely first rate – and it’s a debut to boot. Easily-flowing and matter-of-fact, it takes us into the dark world of an obsessive, where any rationale is entirely his, not ours; where the central figure’s view of his activities leaves room for little else, not even his wife and daughter, even though he says he will do anything for them. The pace is steady and relentless, a bumpy ride down a long road, with the protagonists gradually drawing closer together as if pulled by strings, and the outcome can surely not be great for one or more of them.